120 Schools, Lake Grove, class photo. 1st row: Thelma, _, Jane Bass, Patty Kelly, Diane Elliot, Eileen Chamberlin, Betty Wolf, _. 2nd row: Jimmy Peterson, Carol LeMasters, Stanley Griffeth, Marky Allender, Charles Carter, Patty Brennen, Larry Moreland. 3rd row: Denny Reese, Dolores Roschene, Noel Meyers, Eunice Anderson, _ Rollins, Judy West, _. 4th Row: Jerry Anderson, _, _, Conrad Sundholm, Chenyl Cramer, Terry Terril, Molly Gray? Description Scanned as B & W. Sign in photo: Lake Grove School, No. 407 May 3 '45. Teacher is Clara Hargreaves. 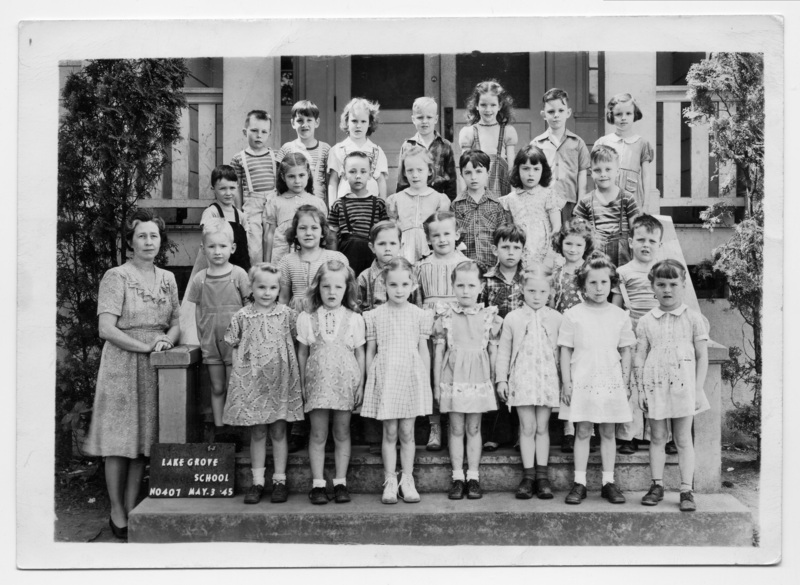 Transcription 120 Schools, Lake Grove, class photo. 1st row: Thelma, _, Jane Bass, Patty Kelly, Diane Elliot, Eileen Chamberlin, Betty Wolf, _. 2nd row: Jimmy Peterson, Carol LeMasters, Stanley Griffeth, Marky Allender, Charles Carter, Patty Brennen, Larry Moreland. 3rd row: Denny Reese, Dolores Roschene, Noel Meyers, Eunice Anderson, _ Rollins, Judy West, _. 4th Row: Jerry Anderson, _, _, Conrad Sundholm, Chenyl Cramer, Terry Terril, Molly Gray?